CWN comes to the Magic City. January 23. Birmingham's free community events platform for creative professionals. A free weekly conference for and by Birmingham's startup community and creative professionals. CoWorking Night is a free weekly conference for Birmingham's professionals come to learn, connect, and collaborate. Anyone of any age or background is welcome to attend. No RSVP is required; just show up! 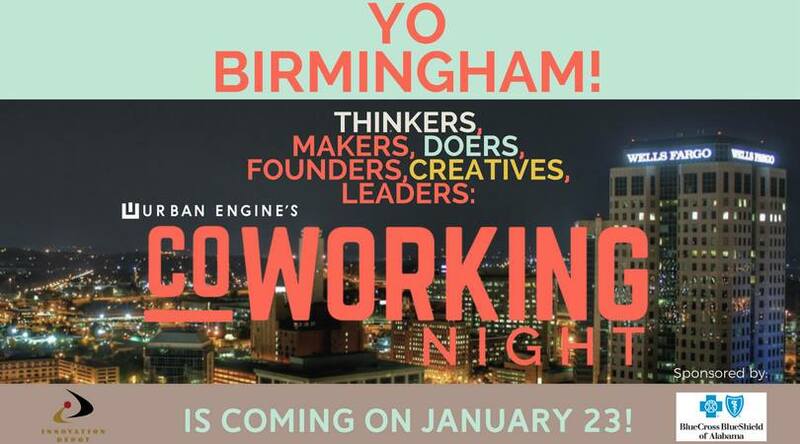 CoWorking Night Birmingham takes place at Innovation Depot event Tuesday night from 5:30-9:30pm. Innovation Depot is 140,000 square feet of amazing office, lab, and coworking space. As the largest tech startup program in the Southeast, Innovation Depot provides unmatched amenities like an onsite game room, gym, rooftop patio, restaurant, and the fastest internet in Birmingham.